EZ Stor. 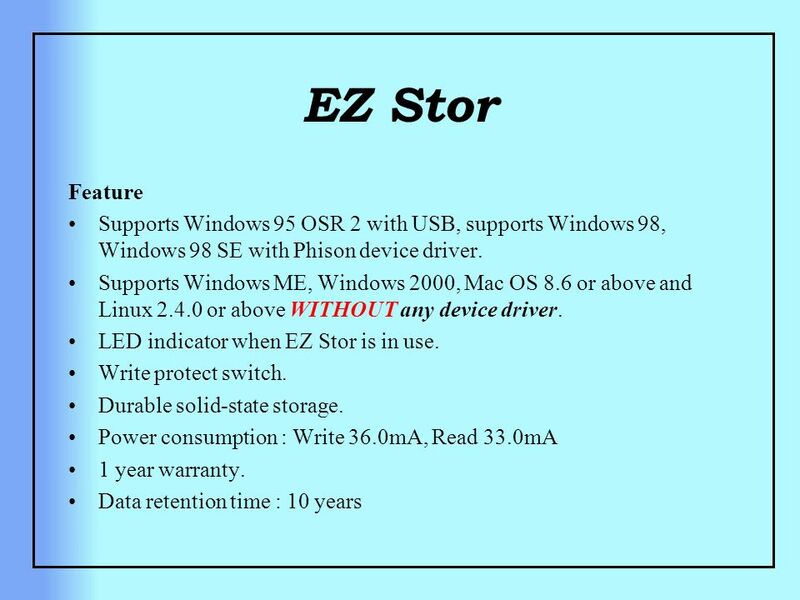 Feature EZ Stor is a USB type plug & play removable flash drive. Storage space from 8MB up to 1GB. Supports flash ROM for ISP (In-System Programming). 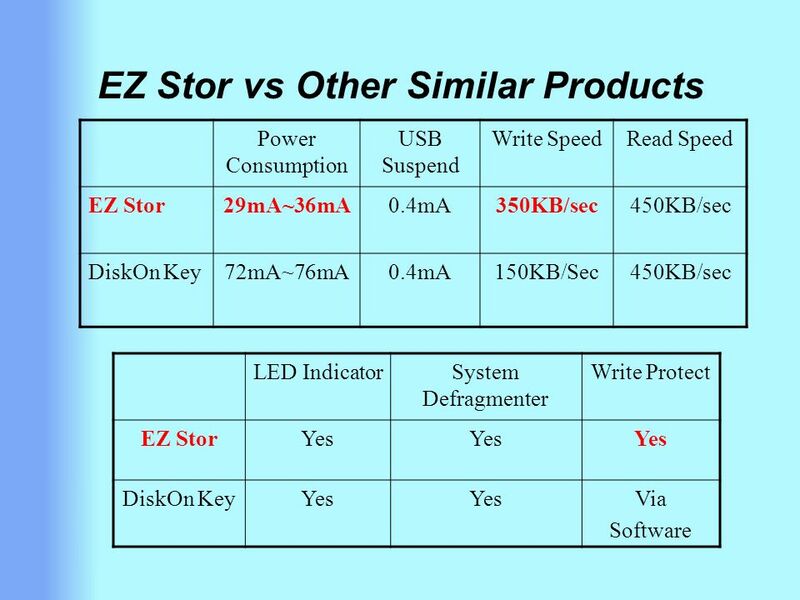 2 Feature EZ Stor is a USB type plug & play removable flash drive. Storage space from 8MB up to 1GB. Supports flash ROM for ISP (In-System Programming). No external power required. Powered from USB port. Supports Toshiba & Fujitsu & Samsung NAND flash memory 32Mbit, 64Mbit, 128Mbit, 256Mbit, 512Mbit and 1Gbit. Supports USB specification reversion 1.1 Transferring rate up to 12Mbit per second at Full Speed. Supports Power Saving Mode. 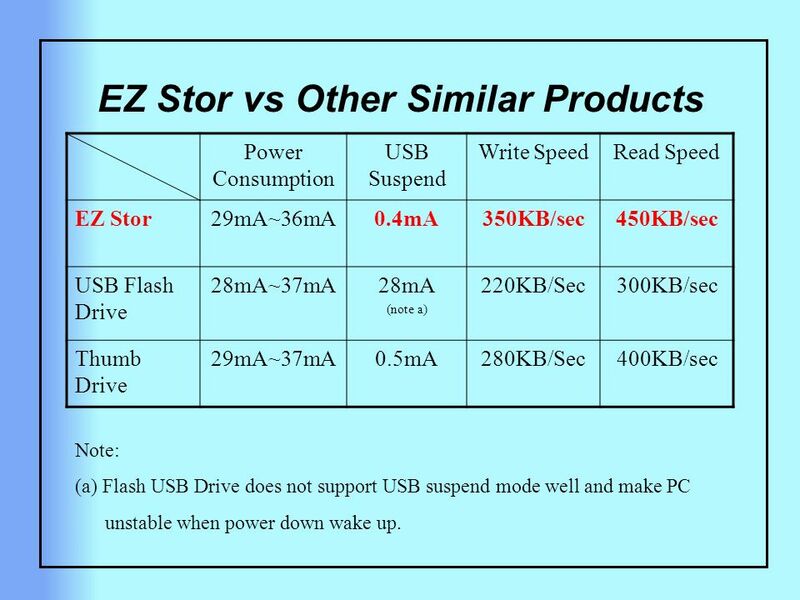 6 EZ Stor vs Other Similar Products Power Consumption USB Suspend Write SpeedRead Speed EZ Stor29mA~36mA0.4mA350KB/sec450KB/sec USB Flash Drive 28mA~37mA28mA (note a) 220KB/Sec300KB/sec Thumb Drive 29mA~37mA0.5mA280KB/Sec400KB/sec Note: (a) Flash USB Drive does not support USB suspend mode well and make PC unstable when power down wake up. 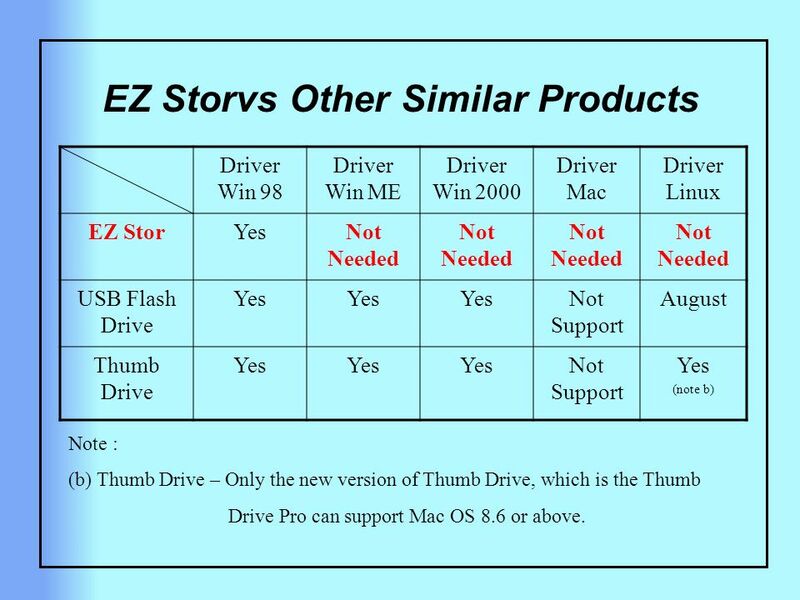 7 EZ Storvs Other Similar Products Driver Win 98 Driver Win ME Driver Win 2000 Driver Mac Driver Linux EZ StorYesNot Needed USB Flash Drive Yes Not Support August Thumb Drive Yes Not Support Yes (note b) Note : (b) Thumb Drive – Only the new version of Thumb Drive, which is the Thumb Drive Pro can support Mac OS 8.6 or above. 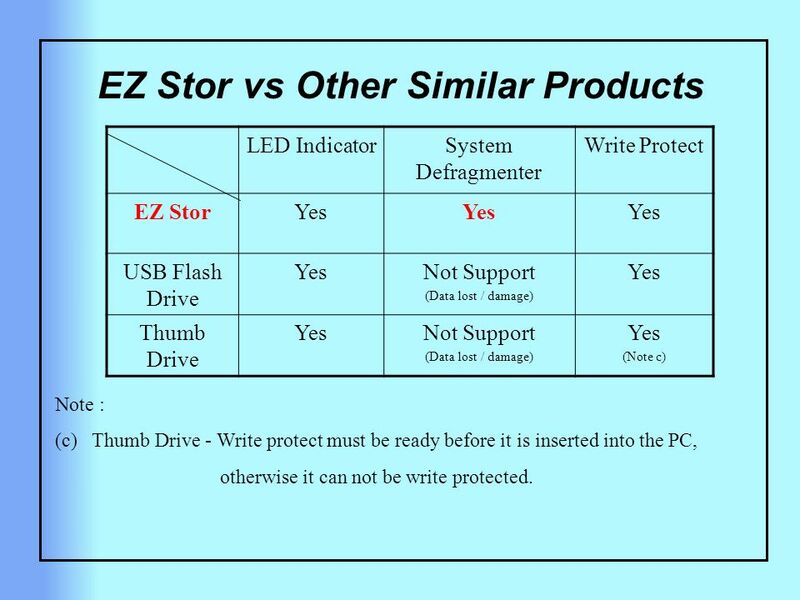 8 EZ Stor vs Other Similar Products LED IndicatorSystem Defragmenter Write Protect EZ StorYes USB Flash Drive YesNot Support (Data lost / damage) Yes Thumb Drive YesNot Support (Data lost / damage) Yes (Note c) Note : (c) Thumb Drive - Write protect must be ready before it is inserted into the PC, otherwise it can not be write protected. 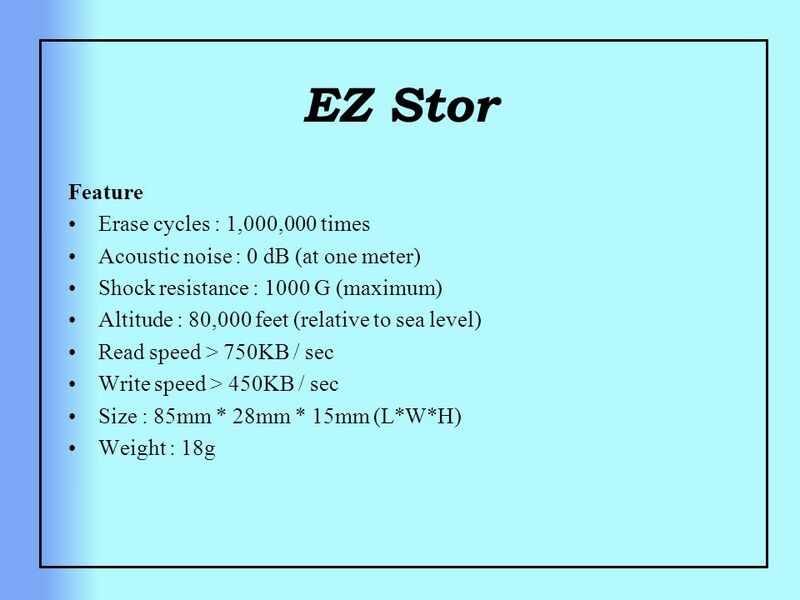 Download ppt "EZ Stor. 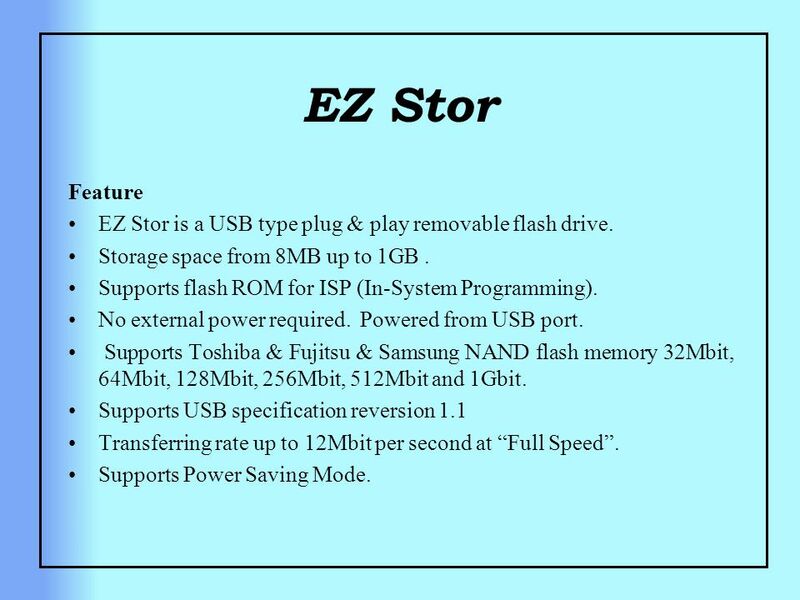 Feature EZ Stor is a USB type plug & play removable flash drive. Storage space from 8MB up to 1GB. 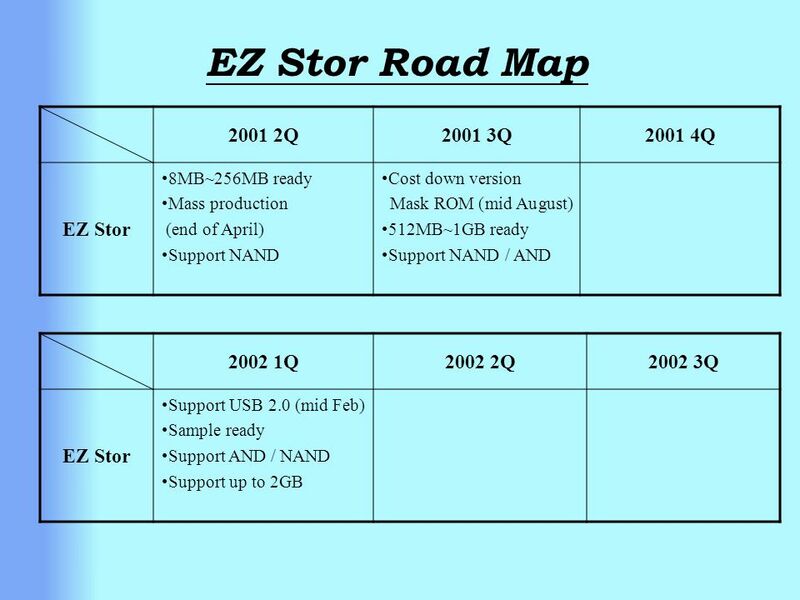 Supports flash ROM for ISP (In-System Programming)." SUNIX Taiwan Headquarters SUNIX Vertriebs GmbH SUNIX do Brasil. 1. HDD Partition Setup Insert Booting Diskette to A: drive and turn on the power. Then it will be boot by floppy diskette. 1 Type FDISK and press Enter. 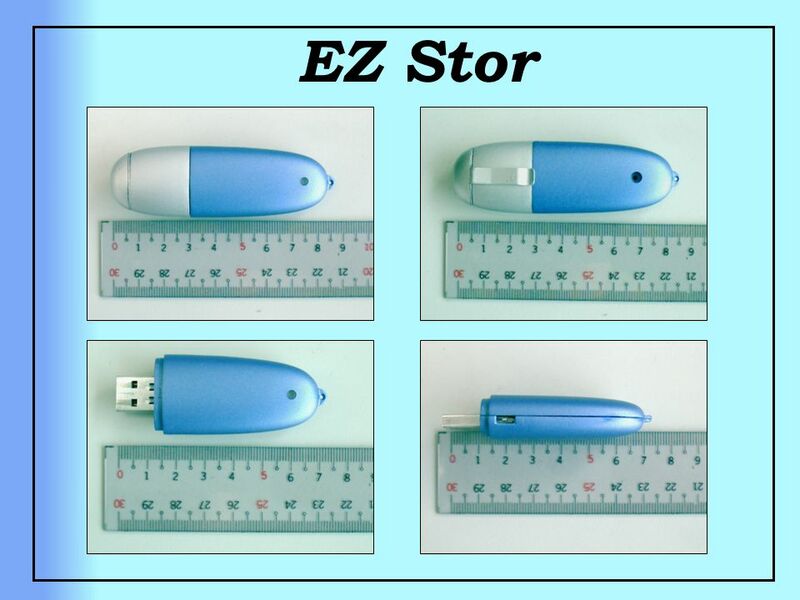 USB Multi Drive Card Reader/Writer Controller & Turn-Key Solution Reads : SD / MMC / SM / CF / MD. 6-April 06 by Nathan Chien. PCI System Block Diagram. Introduced 1982 Used mostly in embedded applications - controllers, point-of- sale systems, terminals, and the like Used in several MS-DOS non-PC- Compatible.